Views, views, views! For breathtaking Smoky Mountain sunrises and sunsets, stay at Views Above the Rest! 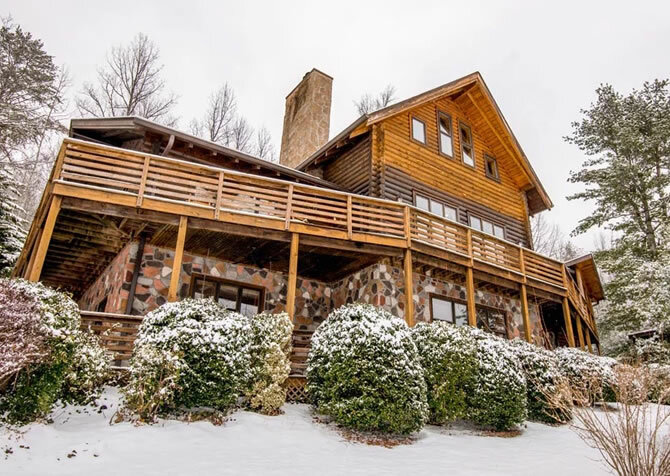 Rightly dubbed, this large 5-bedroom, 5-bathroom rustic-look cabin in Gatlinburg Falls Hidden Valley Resort will make you fall in love with the natural beauty of the Smokies. 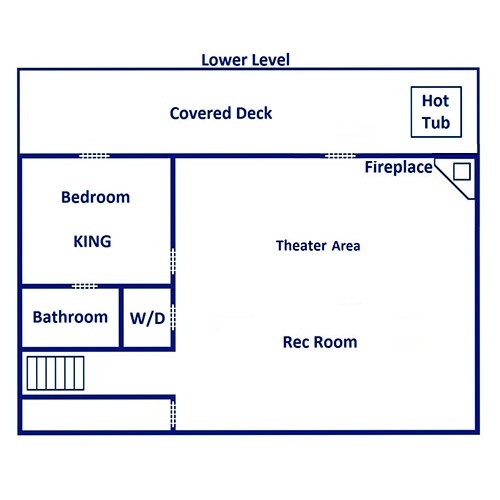 Remain captivated for hours on end by the everchanging sky or head inside the cabin for game night in the rec room, the latest episode of your favorite TV drama on the big screen TV, freshly baked brownies in the fully equipped kitchen, or sweet dreams on one of 4 king-size beds! From luxurious amenities to jaw-dropping views, you'll be blown away by the treats you'll find here. 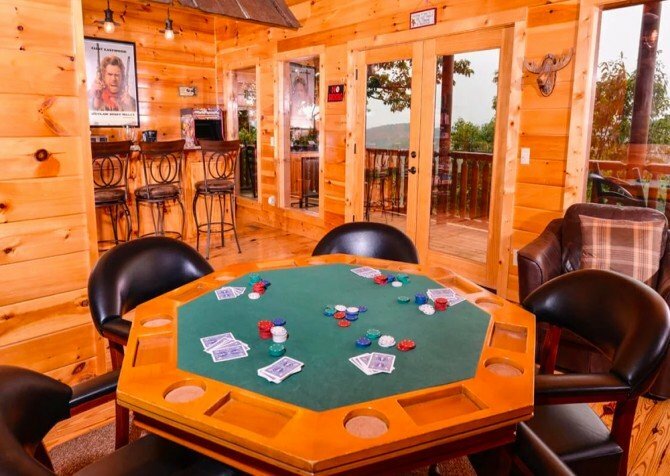 Even better, this gorgeous cabin is perfectly situated within 500 feet of 3 other gorgeous and spacious cabins: Unforgettable Views & A Theater (directly next door), Cherokee Dreams Lodge, and Splash 'N Views - very easy walking distance! 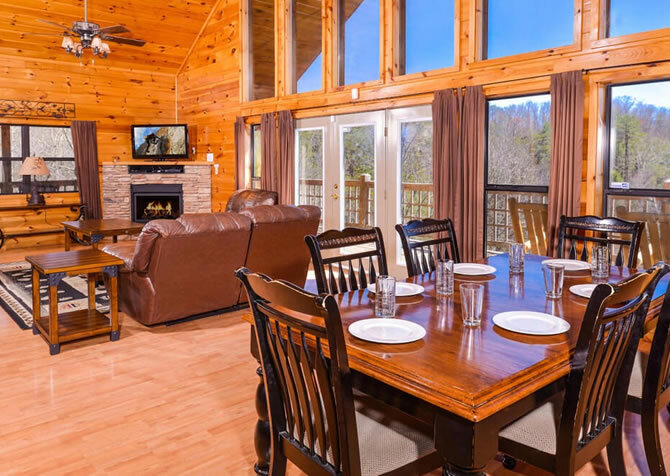 So when you're planning a wedding and need lots of space nearby or have a big family group heading to the Smokies, you can book all of them together for privacy and proximity! Leave your bags in the car and take a load off on the 2 bold-red couches in the cozy and rustic-meets-luxurious living space. 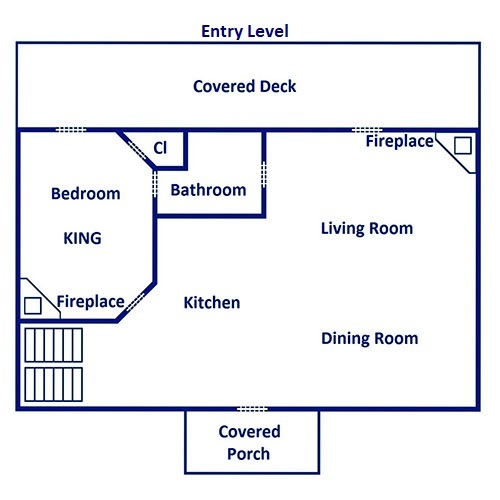 Snuggle up with your sweetheart and a few pillows while the little ones crawl around the large area rug. Soak in the mountain views from the large windows or flip on the 65-inch Smart TV to watch the big game in HD. With piles of savory snacks on the large coffee table and sweet drinks on the end tables, let the party begin! In the evening, turn on the electric fireplace (no heat) to create a more calming mood for friendly chats or relaxed reads. Only steps away lies the fully equipped kitchen with all major appliances — ready for hearty meals and midnight treats alike! With an open floorplan to keep everyone connected, sit the kids at the bar for 4 to help stir ingredients, knead doughs, cut out animal-shaped cookies, and decorate their creations. Keep fresh veggies cool in the fridge, cook up a family favorite on the stove, prepare popcorn for movie night in the microwave, brew an evening blend in the coffeemaker, and let the dishwasher take care of the mess! Close by awaits the dining area with a large wooden table for 10 — eager for energizing breakfasts, light lunches, delectable dinners, and decadent desserts! Need more space? Sit down at the 4 hickory bar stools to enjoy your meal or a drink. After the food settles, clear the table for arts and crafts midday or hot cocoa with marshmallows at night. Better yet, use the space to plan your day out in Gatlinburg with family and friends. Enter the rec room for a day of gaming and an evening of victory! Challenge your bestie to see who will cross the finish line the fastest on the Super Cars driving game or win the checkers war on the game table. Take things easy with a few rounds of pool or up a notch with the Multicade unit. Chill with a nice chat on the 3 couches and wrap up the night with a Blu-ray film on the 75-inch HD Smart TV — a fire in the electric fireplace will really add to the ambience. Plus, if the kids fall asleep early, you can simply tuck them into the twin bunk bed behind the theater space. 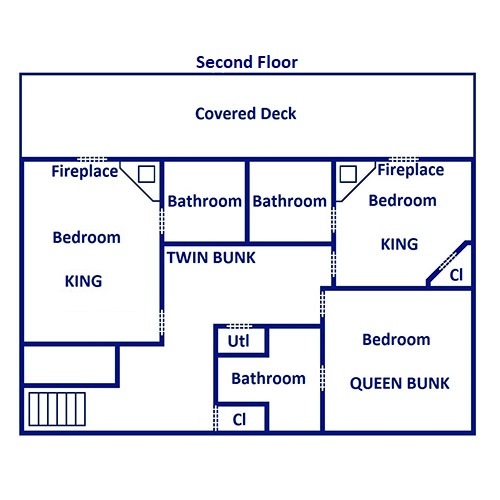 Able to sleep up to 20 guests, this home boasts 2 queen sleepers, 2 twin bunks, and 5 cozy bedrooms — 4 with king-size beds and 1 with a queen bunk. Alternating a serene blue with a soothing natural finish, the 2-toned wood paneling present throughout the home continues into each bedroom, creating a sense of calm as you head to dream land. Additionally, each bedroom has a 50-inch Smart TV, great for catching up on hit TV dramas. Last but not least, 4 of the bedrooms feature direct access to one of the 3 spacious decks and an electric fireplace to set the optimal cabin mood. After a smooth drive, pull up to the cabin on a flat, paved driveway that’s motorcycle friendly with room for 5 vehicles (including a trailer). Featuring 3 sizable decks, have as much fun outside as you do inside with the outdoor hot tub — complete with a flatscreen TV — teak wood rocking chairs, charcoal grill (picnic style), and unbelievable mountain views! Watch the sunrise with your morning coffee, fire up the grill for barbecue night, rock away all your worries and cares, and relax with a comedy show. Not to mention, the hot tub is just off the rec area, so you can sip champagne and soak away while the kids play within earshot. 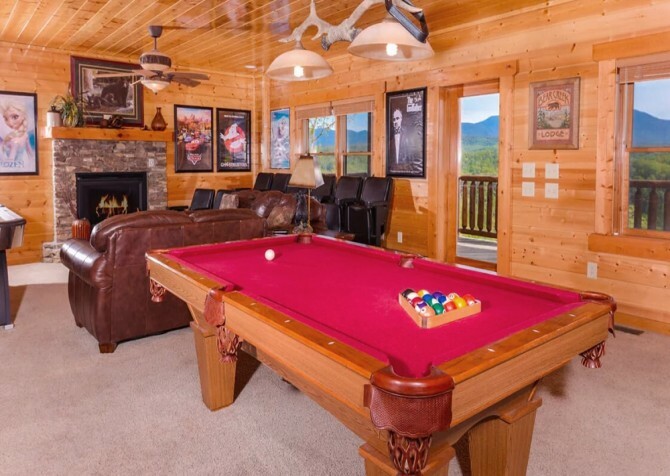 In addition to all these amenities, this cool cabin has access to the community pool at Gatlinburg Falls Hidden Valley Resort for splashing summer days, high-speed internet to keep up with emails easily, and a washer, dryer, and ironing board to keep your clothes clean and your look sleek. Host a dance party with groovy tunes on the CD player or a scary movie night with a horror classic in the DVD player. The beautiful and top-rated (rated #1 Best Family Resort by Southern Living magazine) Gatlinburg Falls Hidden Valley Resort also offers wedding and conference facilities, perfect for Smoky Mountain “I DOs,” meetings, and more. Ready for a day filled with adventure? Head downtown for fantastic rides, intriguing sights, fun activities, and even cooler attractions! Soar through the trees and over the mountains on the Gatlinburg Mountain Coaster at your own pace — you have to try this! You’ve heard of the USA Today Readers’ Choice for Best U.S. Aquarium, right? Visit Ripley’s Aquarium of the Smokies to find out what makes it so special — you won’t regret it. Get ready for snowtubing, ice skating, skiing, shopping, dining, playing…the list goes on at Ober Gatlinburg!